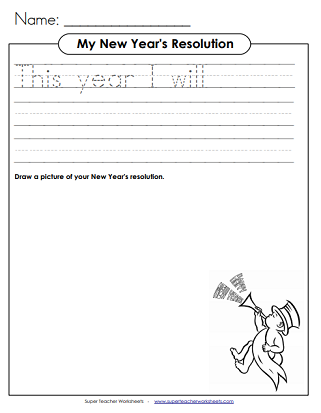 Celebrate the New Year with these printable worksheets and activities. Students write a sentence about their New Year's resolution, then draw a picture. This worksheet has dotted, primary lines for writing. Students write a short paragraph about their New Year's resolutions. They have to state their resolution and tell why they chose it. 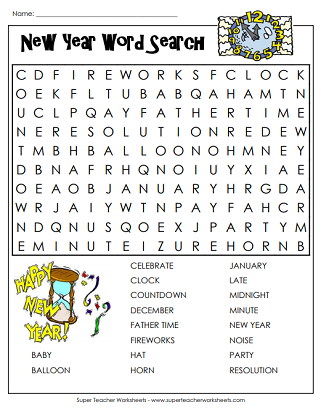 Find the hidden New Year words in this puzzle. Your students can color, cut, assemble, and wear this fun New Year's crown. It reads, "Happy New Year" and has the year 2019 on the front. Ring in the year 2020 with this awesome headband craft. We're already prepared for the year 2021! This is 2021's printable New Year crown craft. In a few short years it'll be 2022. We won't be scrambling to get the New Year's crown up on the site. It's already here! Erica's New Year's resolutions are a little too ambitious, but when her mom convinces her to come up with one resolution she can really stick with, Erica discovers the perfect plan for the New Year. This worksheet has a picture of a boy and a girl celebrating the New Year. The girl has a cell phone and the clock reads midnight. This worksheet has a picture of a boy and a girl watching fireworks. The boy is holding a New Year noisemaker. Students write a story to explain what's happening in the picture. Time: How Long 'Till Midnight? 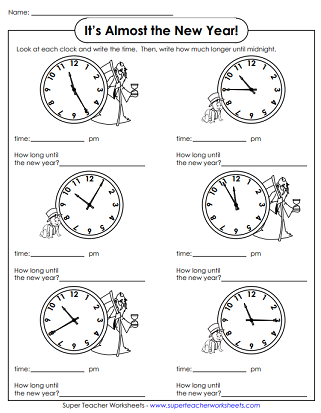 Write the time shown on each clock and tell how many minutes until the New Year. Find the sums of the money amounts. Then use the answers to build a picture of Father Time and Baby New Year. Keep track of student homework or reading assignments on this sticker chart featuring Father Time and Baby New Year. Printable worksheets to celebrate MLK day. Printable worksheets for celebrating Christmas in the classroom. Download and print a Chinese Zodiac calendar and Chinese New Year puzzles and games.